Home » Awesome! (6) Easy Ways to “E-verify” Your Income Tax Return. Today I’m going to show you exactly how to e-verify income tax return using pre-validation. E verification of ITR is mandatory otherwise it will be treated unfilled. Once your ITR is uploaded on the e-filing website, you get 120 days to verify your return. ITR form asks the taxpayer before the commencement of filling your return to “select one of the below option to verify your income tax return”. Step by Step guide of Pre validate Bank account. Step by Step guide of Pre validates the Demat account. How to E-verify ITR by generating EVC through Bank account Number. How to E-verify ITR by generating EVC through Demat account Number. What If you fail to e verify your ITR? In this article, you will get 5 (five) easy steps, to verify your ITR. (one method is physical verification and 4 methods are electronic through EVC). Point to be noted, the tax payer generate EVC & prevalidate you bank account and Dmat account before or after filling ITR. All 3 (three) options above lead you to EVC generation. We will dive deeper to understand how to generate EVC. Click My profile setting, you will get options of Prevalidate Bank account. Let’s start with Prevalidate Bank account. Click Prevalidate Bank account options, you will get a simple form to enter the bank information first. 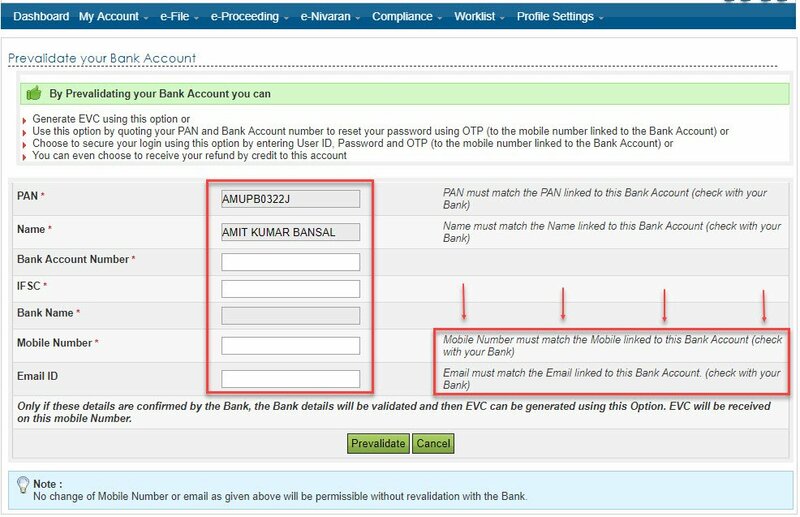 Fill simple information bank account number, IFSC code, Bank name along with the mobile number and email ID, (it is important that the mobile number and email ID linked to the bank you mentioned above). Finally, you will get your bank account is added and verified by the bank. That way your bank account is added and validated. Pre-validation through Demat account is as similar as prevalidation of bank account. Click My profile setting, you will get options of Prevalidate Demat account. Let’s start with Prevalidate Demat account. Click Prevalidate Demat account options, you will get a simple form to enter the Demat information first. Fill simple information select Depository type, fill DP ID, Client ID, Mobile number and email ID, (it is important that the mobile number and email ID linked to the Demat account you mentioned above). 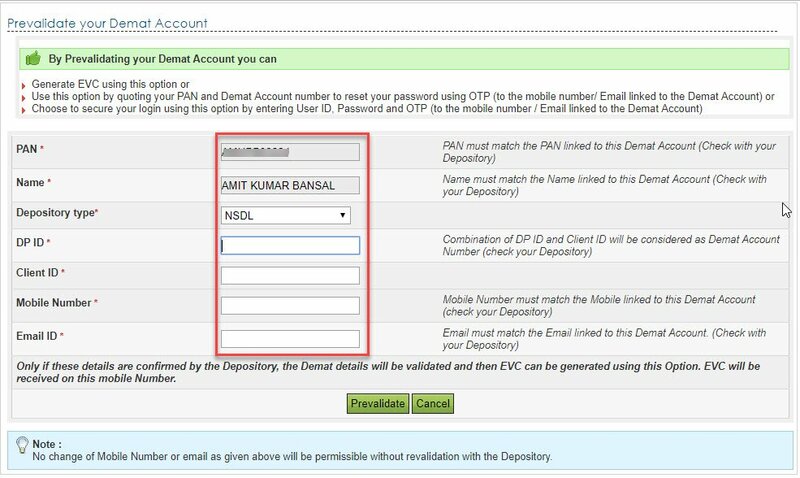 You can see your Demat account number, mobile number and your email ID is verified by the depository. Once the process of prevalidation of bank account or Demat account is completed you have to climb back to Generate EVC option. Generating EVC through net banking or verifying your ITR through net banking, in both the scenario you are just opening the gate of ITR website through your net banking option. In almost every net banking option you can click ITR e filling and get directly to ITR form, login into income tax website is also not required. Click continue that will bring you a list of banks through which you can enter income tax portal. 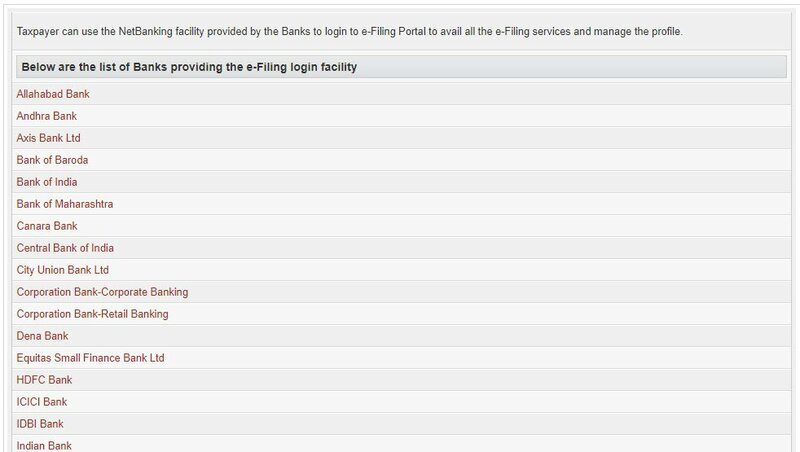 Login to your net banking (by clicking the bank name above), then click E filling option on your screen. You are redirected again to income tax portal. (but this time you have entered through net banking). Go to my account menu and click to generate EVC. By click generate EVC, you will get the message on your screen. And at the same time, you will get the SMS on your mobile number and an Email on your Email address of EVC. That EVC will help you verify your return in simple steps. E verify your ITR through bank account number is also as similar as net banking. First, you have to pre-validate bank account (step by step process mentioned above). As you have already prevalidated your account number, all you have to do is click Yes. Now you will get SMS of EVC on your mobile number. That EVC helps you e verify your return if you select e verification though bank account number. Verification through Demat account number process is as similar as verification though banks account number. First, you have to pre-validate your Demat account (step by step process mentioned above). As you have already prevalidated your Demat account number, all you have to do is click Yes. That EVC helps you e verify your return if you select e verification through Demat account number. Verifying your ITR from aadhar is the easiest way and a common way to select by the Taxpayer. Before verification through aadhar card, two things you must check. And your aadhar is liked with Pan number. Verification through Aadhar doesn’t require any prior exercise link prevalidation of bank and Demat account. Once you have completed your return and submit. 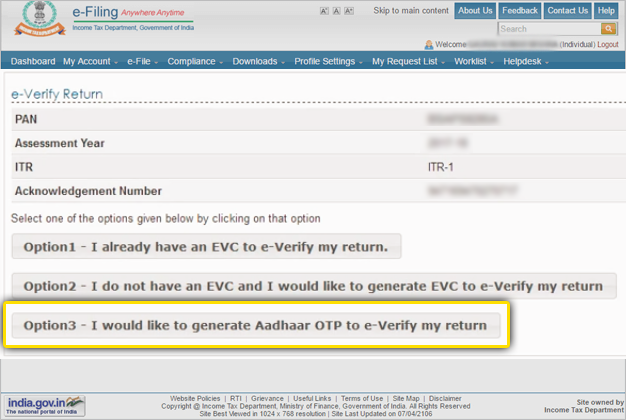 you will get three options, click to the third one “to verify the return using aadhar OTP”. When you click this you will get an OTP on your registered mobile number which will directly help you “e verify” your income tax return. The OTP is valid for only 30 minutes. E-verification using Bank ATM is the least option any tax-payer prefer. Using ATM EVC generation is also easy to execute. The reason behind the selection of this option is that the income tax department only allows selected Bank ATM to provide this facility. Only these 6 banks are allowed to avail of this facility. Visit your bank’s ATM and swipe your ATM card. You will get EVC code on your registered mobile number (which is valid for 72 hours). The final step is to log in to your income tax portal. And, your tax return is verified. These are the 5 option which is opted by the taxpayer if electronic mode. If you cannot verify using electronic way, you can send your form physically by post. Take print out of your filled form in A4 size paper with dark ink. Sign every paper with a blue ink pen. You will get the SMS on your registered mobile number and Email after your ITR-V received by Income tax department. E verification your ITR is as important as filling your return, without verification your e filing is waste of time. I recommend, reading this article twice, to understand every step clearly, although it is very easy to understand for the new taxpayer it is slightly tricky. Recently I have received a whats up message from my friend “Dinesh”. 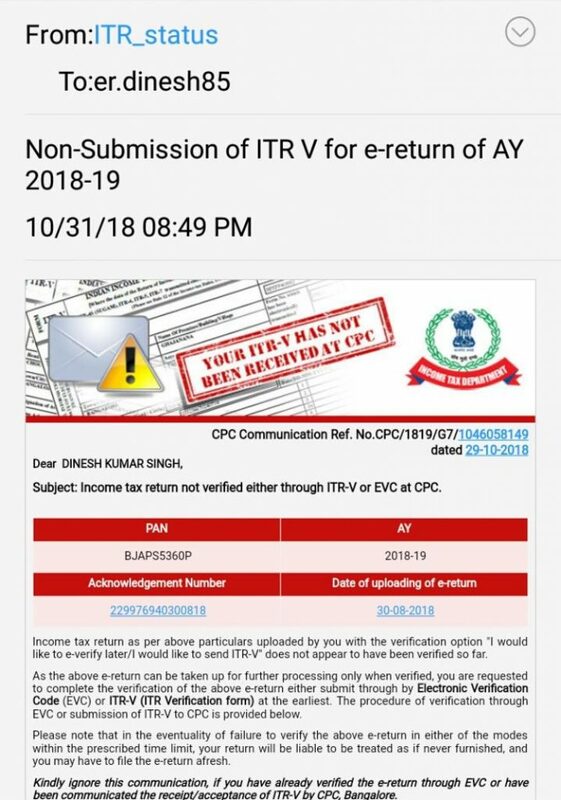 This message clearly indicates and a reminder to e-verify income tax return within 120 days of the date of uploading the e-return. What happens if you fail to e-verify your return? It is very clear if you do not E-Verify your returns than that is almost equal to not filing it. The Taxpayer has to face a lot of consequences begin with the penalty of late filing. You also receive notice from income tax department.